In 944 CWELT-2007 LLC v. Bank of America (3D15-2091), the Third District granted a petition for certiorari that sought to quash an order denying a motion to cancel a foreclosure sale. On the date of the scheduled foreclosure sale, a motion for rehearing directed to the final judgment remained pending. The court stated that "it is well settled that a foreclosure sale cannot be held while a timely motion for rehearing is pending because enforcement of a final judgment is suspended by the filing of the rehearing motion." One other procedural issue was included in the opinion. The court stated that it "consider[ed] the Bank’s decision not to file a response to the petition as the equivalent of a confession of error." In Zoba v. Coral Springs (4D14-1182), the "boundaries of judicial immunity are challenged." The Fourth District's majority opinion, written by Judge May and joined by Judge Gillen, explained that the plaintiff/appellant argued "that the clerk of court (“clerk”) is not entitled to judicial immunity for collecting, apportioning, distributing, and retaining monies, in conjunction with alleged illegal traffic fines." The facts are simple: "The plaintiff received a $600 traffic ticket for speeding in the school zone. He paid his fine in full because failure to comply would result in the suspension of his driver’s license." Later, "Plaintiff’s counsel received a ticket for the same violation on a different date. He fought the ticket arguing that the school zone was illegal because it was established in violation of county ordinance 23-6(d). He was acquitted." The plaintiff sought a return of the money collected by the clerk for fines issued and paid in what was later determined to be an illegal school zone. The question in the case was whether the clerk of court was entitled to judicial immunity for collecting the fines before the school zone was found to be illegal. "[J]udicial immunity ‘insures that judges are immune from liability for damages for acts committed within their judicial jurisdiction [and] is essential to the preservation of an independent judiciary.’” Fong v.Forman, 105 So. 3d 650, 652 (Fla. 4th DCA 2013) (second alteration in original) (quoting Berry v. State, 400 So. 2d 80, 82–83 (Fla. 4th DCA 1981)). “This doctrine has been extended to quasi-judicial officials, such as a clerk of court, performing judicial acts.” Id. (citations omitted). “The reason for extending immunity to quasi-judicial officers is because a strict guarantee of immunity is necessary to preserve the[ir] effectiveness and impartiality.” Fuller v. Truncale, 50 So. 3d 25, 27–28 (Fla. 1st DCA 2010) (alteration in original) (citation omitted) (internal quotation marks omitted). Further, the court explained that "[t]wo prerequisites must be met for judicial immunity to apply: '(1) the ruling in question [must be] a ‘judicial act;’ and (2) there [must be] jurisdiction to issue the ruling.' Fuller, 50 So. 3d at 28 (citations omitted). 'When these two prongs can be shown, the judge or quasi-judicial official may claim judicial immunity, even if the ruling in question was unwise, reckless, or malicious.” Id. (citation omitted)." These statutes and rules read together support the clerk’s argument that his collection, apportionment, and disbursement of traffic fines is part and parcel of the overall judicial process. Prior to the fine collection, the person who has received the noncriminal traffic infraction may appear before a court, or may waive that right and simply pay the ticket or enter into a payment plan. Either way, the person participates in the adjudicatory process or waives it. The clerk’s act of collection, apportionment, and disbursement is part of that judicial process—it is a judicial act entitling the clerk to immunity. And no one disputes the jurisdiction of the court and the clerk to perform their respective statutory duties. Because the clerk’s collection, apportionment, and distribution of the fines are both statutorily and judicially ordered, they fall within the protection afforded by judicial immunity. Having resolved the issue of judicial immunity, the court addressed "the elephant in the room," which was whether the clerk could be required to refund the money. The court stated that "Here, if the school zone is found to be illegal, then a traffic fine for an infraction committed in the school zone is unconstitutional, but the administrative costs the clerk earned by statutorily collecting the fine are not. The clerk earned the costs for performing his statutorily and judicially directed job. Judicial immunity bars the clerk from having to defend against the plaintiff’s claim and incur attorney’s fees. We therefore affirm the dismissal of the clerk." In the complaint, the plaintiff alleged an unjust enrichment claim against the clerk seeking to recoup all monies paid and retained. Today, we hold the clerk immune from the underlying suit and defense of the suit, and affirm the trial court’s decision on immunity. What has yet to be litigated is whether the plaintiff can recoup monies paid to the clerk should he succeed in obtaining a favorable final judgment. There are several hurdles the plaintiff must first overcome: (1) proving the school zone was illegally created; (2) defending the voluntary payment waiver defense; and (3) whether the clerk must refund monies beyond the administrative fees authorized by statute. Wisely, the trial court foresaw the issue, but the case was not yet in the procedural posture for the trial court to rule on it. See, e.g., State v. Barber, 301 So. 2d 7, 9– 10 (Fla. 1974). We save that issue for another day. Judge Warner wrote a dissenting opinion that began: "Although I agree that the clerk of court can assert judicial immunity for the acts of collecting and distributing the traffic fines, including the administrative fee, I cannot agree that there is any judicial immunity for the retention of the portion of the fine which the clerk is allowed to keep in a fine and forfeiture fund pursuant to statute. That is directed by statute, not judicial discretion. See §§ 28.246(3); 318.21, Fla. Stat. (2010). In fact, pursuant to section 28.246(3), as quoted by the majority, such funds are disbursed “in accordance with authorizations and procedures as established by general law,” not judicial authority. § 28.246(3), Fla. Stat. (emphasis added). The ultimate action is not judicial, but statutory. The clerk was not acting as an arm of the court in retaining the funds; he was retaining a portion of the funds at the legislative directive to help fund the clerk’s office, the funding of which is a legislatively controlled action." Last week the Fourth District issued a new Administrative Order regarding agreed extensions of time and an updated Notice to Attorneys and Parties. The Administrative Order regarding agreed extensions of time, Administrative Order 2016-01, can be downloaded HERE. The Fourth District's updated Notice to Attorneys and Parties can be downloaded HERE. 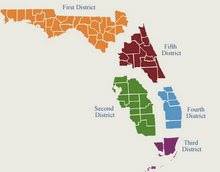 The First District does not have an agreed extension procedure but the Second District, Third District, Fourth District (see above), and Fifth District do. The Second District's administrative order can be downloaded HERE (June 3, 2013); the Third District's administrative order can be downloaded HERE (amended June 30, 2015); and the Fifth District's administrative order can be downloaded HERE (March 8, 2013). In Cornerstone Investment Funding v. Painted Post Group (4D15-1907), the Fourth District reviewed a trial court's order denying a motion to dismiss for lack of personal jurisdiction. The procedural history is somewhat unique but the holding is not. After conducting an evidentiary hearing, the trial judge "concluded that Post Group had established both jurisdictional facts and minimum contacts between Cornerstone and Florida sufficient to assert personal jurisdiction over Cornerstone." (1) the complaint alleges facts that would subject the defendant to Florida’s “long- arm” statute, and (2) the defendant has sufficient “minimum contacts” to meet traditional notions of fair play and substantial justice such that the defendant could ‘“reasonably anticipate being haled into court’” due to its actions. Venetian Salami Co. v. Parthenais, 554 So. 2d 499, 501 (Fla. 1989) (quoting World-Wide Volkswagen Corp. v. Woodson, 444 U.S. 286, 297 (1980)); Henderson v. Elias, 56 So. 3d 86 (Fla. 4th DCA 2011). In this case, the plaintiff satisfied the first prong because "failure to pay on a contract requiring payment in Florida has been found sufficient to satisfy Florida’s long-arm statute conferring jurisdiction over breach of contract actions. Smith Architectural Grp., Inc. v. Dehaan, 867 So. 2d 434, 436 (Fla. 4th DCA 2004)." The mere fact, however, that Cornerstone allegedly breached a contract by failing to make payments on the contract in Florida would not constitute sufficient minimum contacts with this state to satisfy due process. Taskey v. Burtis, 785 So. 2d 557, 559 (Fla. 4th DCA 2001) (“Factors that go into determining whether sufficient minimum contacts exist include the foreseeability that the defendant’s conduct will result in suit in the forum state and the defendant’s purposeful availment of the forum’s privileges and protections.”); Labry v. Whitney Nat’l Bank, 8 So. 3d 1239, 1241 (Fla. 1st DCA 2009); Ganiko v. Ganiko, 826 So. 2d 391, 394- 95 (Fla. 1st DCA 2002). As neither Post Group’s amended complaint nor Goldin’s hearing testimony showed that any act beyond repayment of the promissory note was required to be performed in Florida, Cornerstone does not have sufficient minimum contacts with this state to support the assertion of personal jurisdiction over it. In The First Liberty Insurance Corp. v. O’Neill (4D14–2895), the Fourth District denied a petition for certiorari because the Fourth District had not decided the issue at the time of the trial court’s decision. Given the lack of binding authority from this court on the underlying issue, and given the split of authority between our sister courts on the underlying issue, we cannot say that the circuit court’s apparent decision to follow the First District’s authority was a departure from the essential requirements of the law at the time of its decision. Thus, because of that procedural posture, we are compelled to deny the petition for writ of certiorari and not decide the underlying issue until a final appealable judgment is entered. Rule 9.400(b)(2) provides that “in original proceedings” a motion for attorney’s fees “shall be served not later than . . . the time for service of the petitioner’s reply to the response to the petition.” Here, the court denied the petition without requiring a response to the petition or, obviously, a reply to a response. Having been first filed after the petition had been denied, the motion for appellate attorney’s fees is denied as untimely.